Marketing: Share of Mind, Share of Market? When starting out it seems like the checks pay for payroll, product, and marketing. Rinse and repeat. Right? If you had to choose, what was paid -it would be- payroll, product replacement, and of course marketing. So how do you know which marketing pieces are the best investment when you are as flat as possible? And do you tell the difference between Marketing: Share of mind, share of market? Business is seasonal, streaky, and under increased pressure, requiring financial acumen and marketing genius. Not many things are worst then wasting money on a marketing piece that needed to have a Return on Investment (ROI) but did not procure one client. The first key. 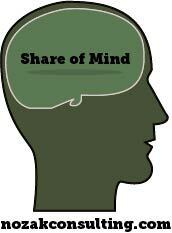 Understand the difference between Share of Market and Share of Mind marketing. Typical share of market pieces include shared mail (RSVP, Money Mailer, Valpak), direct mailers, Magazines, email campaigns, and sales teams. Some marketing can have overlap between share of market and share of mind, but there is one certain way to delineate them. Always put a marketing code on your marketing pieces. For instance, if I were going to market in April of 2015 with RSVP I would put on the bottom corner of my coupon 0415RSVP. Then on the backend or in a spreadsheet I will enter the price I paid and track how many dollars the marketing piece collects, typically returning value as far out as three to five months. This way I can run a return on investment. Say I spent $1 dollar and made four, then my ROI is 4 to 1. This is a great return for a marketing pieces, but some can get as high as 20-30-40 and others can still be profitable as low as 1.2. If you do not track the cost of the marketing piece and the dollars generated from that piece, all though in reality it may be share of market, we can only consider it share of mind. Which is much harder to track and less measurable. Typical share of mind marketing pieces are billboards, radio, television, and P.R. These pieces might not get the phone to instantly ring. The reason is they are not targeted marketing. In reality, the whole population is not your potential client base, but those that are might watch or hear and be compelled to purchase. More often than not these pieces put you in front of non-clients, but when it gets you in front of your buyer, you are getting a share of the person’s mind. Catching customers closer to when they are purchasing can increase the return of share of mind marketing. Both marketing types are important. The key is to use both wisely. If you do not play darts, you never hit the bulls’ eye. Marketing is testing, iterating, testing, and iterating. A Go-To-Market Strategy is clear in rearview or when following an innovator. It takes years to develop a market strategy, a marketing tailwind, analytics, trends and pattern recognition. Marketing is the tree that needs to be pruned, just make sure you know the difference between the trees.